Vitamin E is an antioxidant, and there are endless benefits of using a moisturiser that includes this in its formula. First of all, it is hydrosoluble, and it has been identified as a naturally occurring substance in the human body, as well as in plants. This means when applying vitamin E phosphate to the skin, it has been proven to directly deliver bio functional activities, and a much longer lasting hydration. In addition to being an anti-oxidant, Vitamin E is also an anti-inflammatory. This enables it to reduce the appearance of redness and skin inflammation. This includes the redness of acne spots and scars. If you are someone who is prone to acne, it can not only hydrate your skin without making it oily, but it is also a great alternative to primer (to be used under makeup), ensuring your pores aren’t clogged up. Vitamin E is also a vitamin all pregnant women should be aware of, and taking advantage of. Combined in a moisturiser, it is not only effective for preventing stretch marks, but also for reducing their appearance. Another great advantage is that it can protect you from the sun’s harmful UV rays. These rays can cause your skin UV damage, which can lead to different forms of cancer. Sunlight also destroys your skins natural vitamin C and E sources, which is why its so important to be replacing them. Especially when moisturising is likely already part of your routine, ensuring your moisturiser has vitamin E in it is an easy way to keep your skin healthy. Neutriderm's Moisturising Lotion is the perfect product to use in order to experience these benefits. It uses vitamin E to reduce wrinkles and age spots, and is suitable for all skin types. It is great for winter, as it keeps dry skin hydrated for longer, and perfect for summer to protect you against those harmful UV rays. 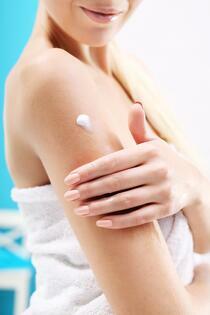 Make the most of your moisturising by choosing the right moisturiser.